I had this odd moment a few weeks ago at the checking out at the grocery store where I had five different kinds of flour in my cart. The cashier asked if I was a baker and I replied that I was a blogger. That was the end of that conversation. As I got home though, I got to thinking more and more about the five different flours I bought. I mean, I bought them because a recipe that I wanted to make called for them. But I realized that if the cashier had asked me what the difference was between all of these flours, I’m not sure I could have given a very thorough answer. Now what kind of blogger would I be if I couldn’t even explain the difference between ingredients I was using. I also decided that I’m probably not the only one who could use a refresher in flour, so I thought I would take a day to explore the world of wheat. The Anatomy of a Wheat Berry. You can make flour out of many different things. Besides wheat, corn is maybe the most common. For this post though, I want to focus specifically on wheat flour because that’s what most people know. Bran – When you look at a wheat berry all you see really is bran. It’s the outer husk of the berry. When flour is being made, each individual wheat berry has to be crushed to remove this part. Depending on the flour, sometimes it may contain the ground bran but for refined flours it’s always removed. The bran has a lot of nutritional value though so it’s a common addition to cereals and stuff. Germ – This is the embryo of the berry. The wheat germ is what actually sprouts the wheat. It’s packed full of Vitamin E and many other nutrients. Guess what. It’s also removed from most flours. So we’ve removed the bran which has lots of fiber and the germ which has lots of nutrients. What’s left? Endosperm – This is what most flour is made of. It’s got a lot of starch and some protein in it and takes up a large percentage of the berry. If you think of a wheat berry as an egg, this would be the white of the egg. Let’s say that I was to give you a few pounds of wheat berries and asked you to make me a loaf of bread. Would you know where to start? I’m not sure that I would. The process sounds easy enough, remove the bran and germ from each little berry and then grind the endosperm up as fine as possible. Ok. Maybe that doesn’t even sound easy. It sounds kind of hard actually. The point is that after doing that for many years, people wised up pretty fast. People started developing water mills and windmills that would do this crushing for them and then they could just separate out the unwanted parts through a series of sieves. Eventually, you’re left with a very fine, ground endosperm which you can use to make all sorts of baking products. Like there are different types of corn and peppers, there are a bunch of different varieties of wheat as well. Each of these varieties has slightly different properties, but maybe most important is the different amounts of gluten protein in the endosperm. Gluten, most basically, is the thing in flour that gives it elasticity when it is kneaded. Gluten is why it’s a bad idea to make a bagel out of cake flour or cake out of bread flour. This is a brief overview of the types of common flours you can find in your store these days. Cake Flour – I consider this the daintiest of flours. It is very soft and has very little gluten (6% to 7%). It makes very airy baked products so it’s perfect for things like cupcakes and cakes. This stuff is ground really fine and is usually bleached also so you end with a perfectly white flour. If something calls for cake flour, it’s a good idea to get your hands on some. I’ve tried to substitute other flours and it just doesn’t work. Pastry Flour – Pastry has slightly more gluten than cake flour (like 8%), but also has higher starch content. This means that it doesn’t develop quite the elasticity that you need for like a baguette, but it can produce really tender results for, obviously, pastries. Unlike cake flour, if you don’t have any on hand you can mix half all-purpose flour and half cake flour and get pretty close. All-purpose Flour – This is the most common flour in America I would say. It’s middle of the road in gluten content (usually around 10-11%). All-purpose flour also can be bleached or unbleached. I basically always use unbleached just because it is more natural and gives the baked product a better flavor I think. Bread Flour – Bread flour also comes in bleached and unbleached options and again I always go with unbleached. If you love bleach though then go to town! No but seriously, as far as I can tell the only real argument to use bleached flour is for color. Bleached flour has a very clean, white look. Bread flour gets into the higher ranges of gluten (12-13%). You would not want to make cupcakes with this stuff. You would want to make no knead bread with it! High Gluten Flour – Any flour with 13%-16% (basically the max) gluten is called high-gluten flour and is kind of hard to find in stores. You can find it online though. Again, it is used for bread products only really. Whole Wheat Flour – You know all of those three parts of the wheat berry? This type of flour actually uses all of them. This makes it incredibly flavorful and nutritious. It also means though that it’s hard to make a good bread with just whole wheat flour. That’s why I like to mix it with other flour types for a lot of different products. 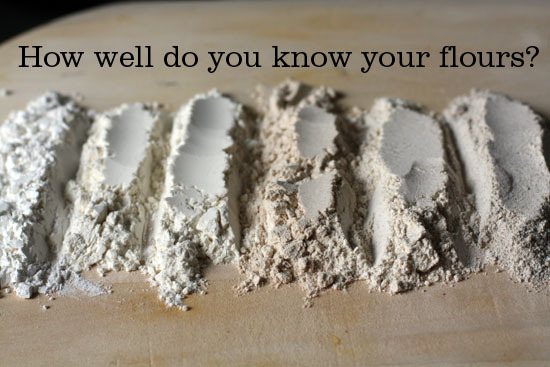 Do you Know your Flours? Kind of hard to tell just by a photo, but these are the flours from left to right in the above photo: Cake Flour, Unbleached Pastry Flour, Unbleached All-Purpose Flour, Whole Wheat Flour, Unbleached Bread Flour, Rye Flour. Rye flour is made out of rye, not wheat, but I through it in because it has a good color. So, what am I missing? Leave a comment and teach me something about flour! A word to those trying to "go green": Unbleached flour is a great way to go to reduce your resources footprint. Removing a step from the milling of flour + removing the need for the bleaching agents = smaller impact. Also, bleaching flour leads to white bread, and when was the last time you heard "white bread" used as a metaphor for something interesting? Thanks very much for the refresher. We have been reviewing all this at church for the making of communion bread–every little change in the flour makes for a change in the altar and for the communicants. For example, Costco is selling big bags of flour that have a bit of whole wheat–under 10%– in the mix, and the dough was very nice to work with, but the bread was too crumbly and reportedly bitter. You have done a great job describing these flours! The only thing I would add is that if you do your measuring for baking by weight and not by volume, these flours do not weigh the same. For example, one cup of sifted cake flour is 100 grams vs. one cup of sifted whole wheat flour which weighs 121 grams. If you are using a metric converter to translate recipes be sure it is ingredient specific. I loved this post, Nick. I liked how you compared a wheat berry to an egg, that was genius. Also, how you mentioned the different varieties of wheat. I use white whole wheat flour for pizza dough, and it comes out passable, if I let it rise two or three times. Now I know from your post, that it is the lack of gluten that makes the difference. Thanks for the comments and additions everyone. Kathy makes a great point about flour weights. It's definitely important to look up the weight for 1 cup of flour if you are measuring by weight which is always a good idea. Hey Nick, great post maybe you can cover all the different rices sometime too. I've got a few more flour tips for you. First off one of the biggest reasons the bran and germ were removed was to increase the shelf life of flour, the nutrients go bad faster than the starch. Then people started to prefer the lighter, softer texture of refined flours and the rest is history. But even refined flour can go bad- I recently had to throw out 3/4s of a 20 pound bag. I won't by large quantities from my small local stores anymore, I drive to the city instead. You'll know if your flour is bad, it smells . . . rancid. However, storing flour in the freezer can prolong the shelf life of all flours and help preserve the few nutrients left in refined flour. Another bonus to freezing flour: It kills weevil eggs that might be in your flour bag, preventing them from hatching and spreading through your whole pantry. 24 hours is long enough to kill the eggs. I love the blank stare I get when I say, in my most cheerful voice, "I'm a food blogger!" Just found glass canisters with little chalkboard rectangles on the front at Pier One (http://www.pier1.com/Catalog/Dining/tabid/493/List/0/CategoryID/111/level/a/ProductID/1579/ProductName/Chalkboard-Jars/Default.aspx) and have been thinking about using them for my flour collection. @Bill: Unbleached flour also has more beta-carotene in it, which gives the bread a better color. More golden. Mmmm. @Christina: If you want a tremendous whole wheat pizza crust, look for Peter Reinhart's Whole Grain Breads book. Soft, pliable, slightly nutty flavor. Nick, flour and bread are one of my favorite topics. In fact, I have some pugliese on my counter in its final proof right now, waiting for the oven to heat. It is white bread candy, but I just finished making some whole wheat "Oat Bran Broom Bread" with some extra bulgar and oatmeal added for a multi-grain texture, also from Peter's Whole Grain Breads book. I grind my own wheat, usually a 50-50 mix of hard red and hard white wheat. I am of the opinion that the hard white makes a better dough, but the hard red has more flavor, so I compromise. Just to clarify, home grinders are nothing like the commercial grinders that make our refined white flour. Those use huge steel rollers that spin at high speed that crack the various parts of the berry apart, which is how you can buy wheat germ and wheat bran at the store. Then, the endosperm gets ground much finer than any burr or stone grinder can grind. Even impact grinders, like the k-tec mill (the one I have) don't grind as fine. These home-ground flours won't make as spectacular loaves because the bran that is in the flour will act like little tiny knives, cutting through the beautiful gluten strands, destroying the integrity of the loaf. Also, home ground flour is filled with enzymes. Many of them are in the bran and are released when it is ground. Some of the enzymes (amylase) help to break down the starches (giving that great nutty flavor) and some (protease) will break down the gluten, resulting in a flat or fallen loaf. Most whole wheat flours you buy will have been aged 2-3 weeks to let these enzymes stabilize. Flour that is more than 24 hours old but less than 2 weeks may give you unreliable results when baking because of the unstable enzyme levels. Freshly ground flour seems to work just fine. There are ways to help combat the enzymes while still getting a good long fermentation (which allows for a softer dough as the bran hydrates). One method, as described by Peter in his Whole Grain Breads book, is to use salt and acid to control the enzymes. Too much of either one and the enzyme activity reduces greatly. His whole grain recipes all use a soaker (flour, water, salt) and a biga (flour, water, yeast) and lets each one sit overnight. It really does make for some fantastic bread. Check it out at your local library or borrow it from a friend. I could go on and on about flour and bread, but since this is not my blog, I will stop here. Just discovered your site, and I love it!!! What combination of berries would you use to make the types of flours you mention? I have a wheat grinder as well, and I find that when I mix certain berries, my chocolate chip cookies come out better because of the lower protein in the combination – no spread (aka cookie puddles). I would love to find out more about home milling – know of any books on the subject (or just user friendly books on milling in general)?